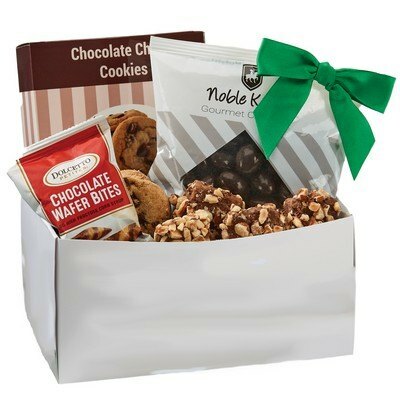 Our Chocolate Dream Caddy features four different types of treats, Customizable with brand logo. The perfect gift for chocolate loving customers, our Chocolate Dream Caddy is sure to promote your brand while impressing your recipients. This gourmet treat is made up of custom printed caddy stuffed with four decadent chocolate treats to enjoy. Rich and delicious chocolate covered almonds, chocolate chip cookies, almond butter crunch and Dolcetto chocolate wafer bites together in one treat will surely spoil them. The caddy is cell wrapped to keep the contents fresh and is finished with a tied ribbon in attractive color options. 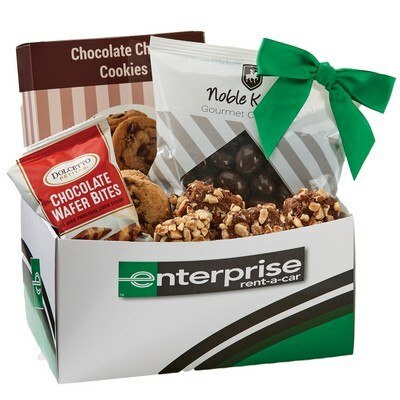 Customize this gift to your brand by adding your corporate logo and advertising message on the box for effective brand promotion.